Kind of like telling LeBron to shut up and just play basketball? The only thing I know about LeBron is that he's tall and he collaborated on a segment of the HGTV show Rehab Addict. Before that show, I'd never even heard of him. Anything else he has done, I'm not aware of. I do know about the football controversy because it's impossible to read the news ticker without having the issue shoved in one's face. And I think it's THE *exquisitely dumbest* thing I've ever seen. Football ratings are in free-fall because nobody wants to pay hard-earned money to see that kind of garbage. They pay money to be ENTERTAINED. If some football players want to make political statements, that is absolutely perfectly fine - let them retire first and do it *on their own time*, instead of taking down an entire national recreational sport with them. The underlying lack of ethics is astounding to me, but I'm self-employed person so perhaps I see things differently. Like entertainers, I get paid to meet the needs of my customers in a voluntary free market exchange of fee for talent, period. What if I were to go to my customers and say, "I'm going to take your money, but rather than delivering what I've promised to deliver in exchange for that money, you are going to have to suffer through my personal grandstanding instead"? It's mind-boggling that anyone would even consider it - it's no different than any other forced religious preaching. It's immoral as well as unethical. But Camping World clearly did not see it that way any more than some of the sports people did. And now Camping World is the most devalued mainstream RV-related provider of all, apparently. Duh, I myself would be out of business in two months if I behaved similarly. This is not rocket science. Duh, I myself would be out of business in two months if I behaved similarly. This is not rocket science. Agree. It's pure stupidity for anyone offering a service to tick-off half their potential customers. Yet, it happens everyday. I just shake my head and smile. As Bill Engvall says "Here's your sign!" Airstream share at the recent Class B rally was 11%. 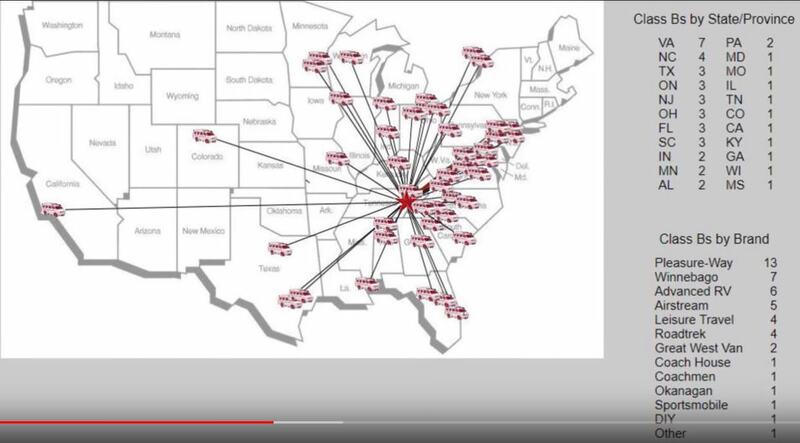 Screengrab from (and HT to) "My Van Trip to Tennessee" YouTube video by Humble Road. This is a completely biased opinion from me. I just purchased my Interstate in November of 2018. I did exhaustive research, looked at LTV, Winnebago, RoadTrek (specifically Etrek and the others), and some others in person. I was open to buying used or new. I even looked into building it out myself or having it built out by a company. The closest competitor for me personally was the RoadTrek Etrek for my purposes. In the end, the fit and finish of the Interstate and the features of the underlying chassis configuration are far superior to any of these other brands even given all the known shortcomings. The determining factor for me was that I am willing to replace the entire house electrical system with aftermarket because of how crappy in general ALL motorhome electrical systems are. So I went with a used model that had the colors etc that I wanted with the intention of using it until it wasn't useful and replacing anything that I want to replace with the savings I had with the price of the used model. I personally couldn't stomach the interior of the Winnebago or the chassis from an design and finish perspective. The cabinetry on all others is just not up to spec for me look and quality. The LTV was close and the ETrek was decent.. but LTV no longer makes the B, only the Bplus. If the Lithium system is a $30k option, I would rather just have an airstream interstate and pay Lew to upgrade for me or do it myself if I had the time. Just FYI the Ultramobility Guy on Youtube has done reviews on most Class B's and a decent job. Here is the Travato review for example. You can scroll through his other videos so to see other class B's. I'm not affiliated with him in anyway. But I did watch all of his Class B videos during my process. Who is LeBaron? I surmise from the posts he is NBA star. Sorry for my ignorance - being a short guy, as a kid I was always discouraged (even ridiculed many times) to not get involved in the tall person's sport. MANSDERM161 - this is why I am counting my blessings that I can do some maintenance and upgrade mods myself. Even if under warranty or willing to pay them to do the work, the long wait is frustrating. Also, having resources in this forum has & will continue to be a big help to me/us in getting things fixed when dealer network can't squeeze as in right away. Without help from this forum, I would be lost. Being a new owner, I now realize that sitting back waiting for one month service appointments at dealers and on top of that waiting for parts from Airstream or Mercedes for another 2-3 weeks if ordered by the dealers is detrimental to enjoying the RV. I am a long time Jeeper and DIY'er so once I have learned all this new stuff I will be in a better position than depending on RV dealers. I am currently attending "Airstream Interstate Forum University". Hope to be caught up soon. This forum is 100% excellent!!! Being a new owner, I now realize that sitting back waiting for one month service appointments at dealers and on top of that waiting for parts from Airstream or Mercedes for another 2-3 weeks if ordered by the dealers is detrimental to enjoying the RV. CHARLIEOSCAR - the one thing I do because dealer is only 20mins from me is if they diagnose a problem and long wait on parts, I pickup my unit and return when parts come in. Yes, it PITA but I refuse to leave my rv just waiting on parts for even 1 week. Exception is if it is a driveability/safety issue. My house a/c never worked properly from mile zero with Firefly. Dealer kept it for 1 week without fixing and then said I have to wait 2-3 weeks more for parts. I retrieved my unit, talked to Firefly & Jackson Center and they sent me the parts and I fixed it myself in 4 days, shipping time included. 3 weeks later, dealer calls saying parts came in. My dealer is just 18 rural miles from me. Mine has not been back at the dealer in 2 years except to replace a cracked outside shower that was cracked when I bought the unit. I have had very few problems with the unit and those I fixed myself. I know of nothing in the Airstream portion of my AI that I can not fix or replace myself. Y'all are going to find yourself tango uniform'd if the mods take exception to this line of jocularity. There is more than one version of that story. Snopes reported on it, and found that the statement was not about people of any certain political affiliation. INTERBLOG - Hehe, I hope not since no real obnoxious words were spoken I think they been pretty cool about things taken a bit close to the edge so long as it's meant in good fun and not maliciously directed to harm someone (well, of course me thinks so, does not mean me is right). For what's it's worth, that's not what he said at all. The reality is that if their sales dropped, it may be because others suffered the same mistake I made when I took my Interstate there to replace the AC. Backed into and destroyed my Stowaway, didn't disclose it and thought I wouldn't notice when they tried to bend it back using a fork lift, and then damaged the roof by dropping the unit on it when they installed it as well as walked all over the roof and dented it, and it took two weeks for that privilege. I'll never, ever, use CW again for any service. It simply couldn't have been any worse. So it's not likely because of what the CEO said, it's more likely because of how he runs the place. If I could give it a minus five stars, I would. JCL - Agree 100% there are at least 3 versions. But he still screwed up as a CEO for not getting ahead of the bad press. CWH has been on a downward spiral since end of 2017. Red line is price, Blue line is forecast trend. 2nd graph smooths out the daily ripples. It does not bode well for anyone holding, employees, and customers see the same. Who would want to hold CWH at this trend line? Having such problems to begin with, why would he inject himself into a controversy? He may be morally & ethically right. And he has the conviction to say what he said and abide by his principles. Admirable traits for sure. But if he had to clarify his statement(s) on multiple occassions, he already is behind the 8-ball. And if he is willing to sacrifice his business to stand up for what is right & righteous, then he is to be commended and admired. But he is also taking the entire ship with him and responsible for the people who works for him. He personally may be able to withstand the fall, but I would bet most of his employees can not. a few professional athletes have decided that their primary duty is not to be rendered in the service of their stock (stock = literal or figurative), but rather they'd prefer to deliver their pet precious ideology in lieu of that for which they were actually hired. I simply consider the source, and drive on...ignoring the opinion.